In February we released a new version of Neptune, our machine learning platform for data scientists, supporting them in more efficient experiment management and monitoring. The latest 1.4 release introduces new features, like grid search — a hyperparameter optimization method and support for R and Java programming languages. The first major feature introduced in Neptune 1.4 is support for grid search, which is one of the most popular hyperparameter optimization method. You can read more about grid search here. In version 1.4 in your Neptune experiment you can pass a list or a range of values instead of passing a specific value for the numeric parameter. Neptune will create a grid search experiment and run a job for every combination of parameters’ values. 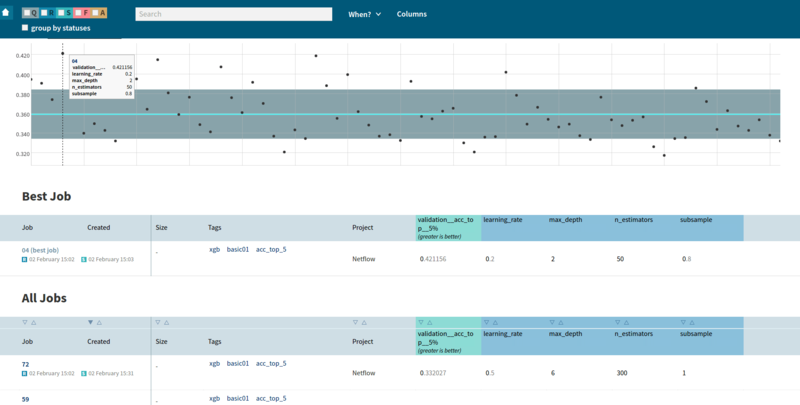 Neptune groups and helps you manage results within the grid search experiment. You can define custom metrics for evaluation. Neptune will automatically select the combination of hyperparameters’ values that give the best value of the metric. Read an example. Neptune exposes REST API, so it is completely language and platform agnostic. deepsense.ai provides high-level client libraries for the most popular programming languages among data scientists (according to the poll taken in the community — see the results). Thanks to client libraries, users don’t have to implement communication via REST API themselves but instead they can invoke high-level functions. Until version 1.4 we only supported client library for Python. In version 1.4 we introduced support for for R and Java (which also covers Scala users). Thanks to new client libraries you can run, monitor and manage your experiments written in R or Java in the Neptune machine learning platform. You can get client libraries for R and Java here. Architectural and API changes that will improve user experience. New approach for handling snapshots of the experiments’ code. Neptune Offline Context — the user will be able to run the code that uses Neptune API offline. I hope you will enjoy working with our machine learning platform, now with grid search support and client libraries for R and Java. If you’d like to give us feedback, feel free to use our forum at https://community.neptune.ml. Do you want to check out Neptune? Visit NeptuneGo!, look around and run your first experiments. Thanks for sharing this type of valuable information. Thanks You. Very Use Full Blog. Thanks For post bescuse this post is usefull me.